Paul Merson has given Arsenal an advantage over their opponents as they look to continue their Premier League campaign later today. The Gunners head to the John Smith's Stadium where they will fight it out with the relegation battling Huddersfield Town and the English television pundit has predicted a 2-0 win for Arsenal. Una Emery's men have no other option than to secure victory if they are to reignite hopes for Champions League qualification for next season. A loss at Manchester City last week has placed them on sixth spot behind Man United who got all three points from Leicester City. This is a chance for them to step up their form on the road as their last away win was at Bournemouth in November and a former player of theirs is giving it all to them. Merson said on Sky Sports: “I’m going to go for Arsenal, but I would not be shocked if they did not win because defensively, Arsenal are just not good enough. Arsenal have not got a comfortable win in either of their last two games against The Terriers. In the first which was Arsene Wenger's last game in charge as manager, it was a 1-0 win, courtesy Pierre-Emerick Aubameyang while the most recent was won with a lone goal from Lucas Torreira. 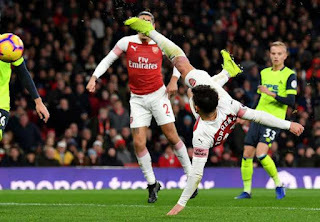 One big positive in the head-to-head record of these two sides is that Arsenal won their last three games with seven goals scored and none conceded. The last time Huddersfield sailed past them was in 1971 - I was not even born then. On the negative side, the North Londoners have not got all three points in four of their last five Premier League games away from home and they are the only side still looking for a clean sheet in a game away from home this season. Arsenal's nightmares are less when compared to that of their opponents that have recorded losses in eleven of twelve games, so Merson's prediction is a highly realistic one.